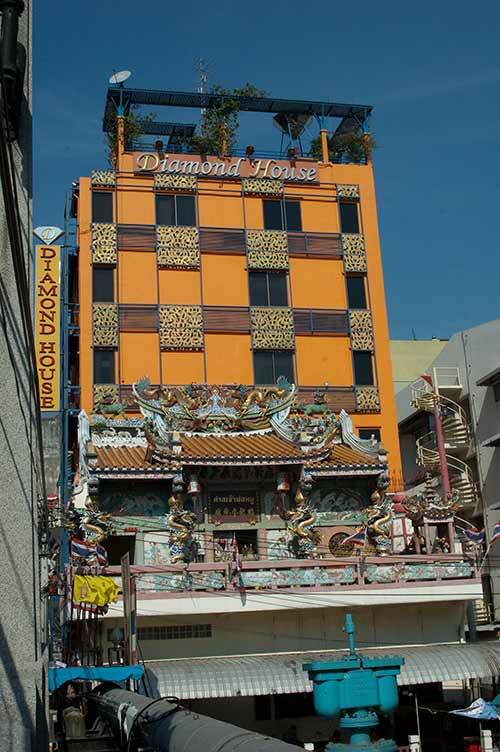 After two nights in the Gold Silver near the airport we moved into the backpackers’s area, Khao San Road. Our taxi driver took us to the street but obviously had no idea where the hotel was so dropped us at his earliest possible convenience. Several people pointed us in the right direction as we walked from the main street, down a twisting passage to our hotel which is on the corner of a covered alley. Our room is tiny with an odd angle into which our double bed barely fits. Also it’s south facing with a barely functioning aircon unit. A very tired and raspy Sue flakes out for the afternoon and I go exploring, heading up the alley and away from the throngs of backpackers. 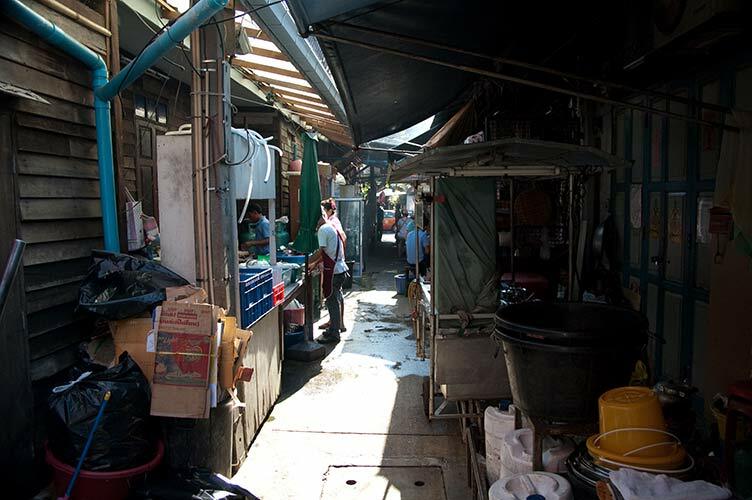 This is the part of SEAsian big cities I love: the narrow, twisting passages. 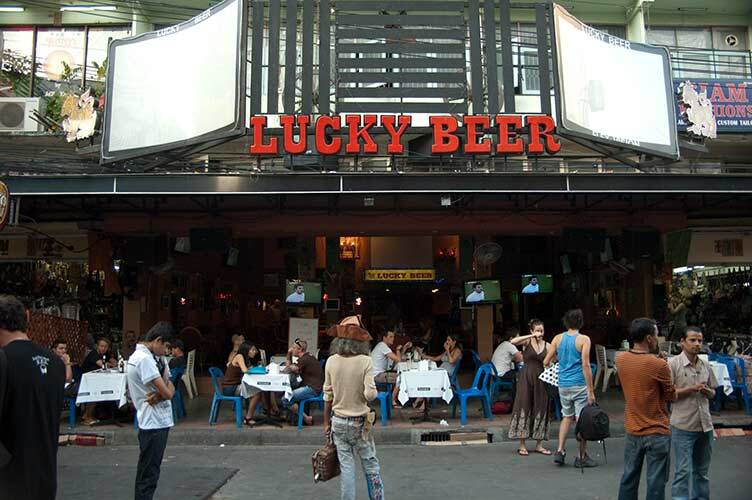 I keep track of right/left turns and eventually find myself back on Khao San Road. Throngs of people wander the almost trafficless street which is lined with bars, shops, hotels and cafes, all doing a brisk trade. 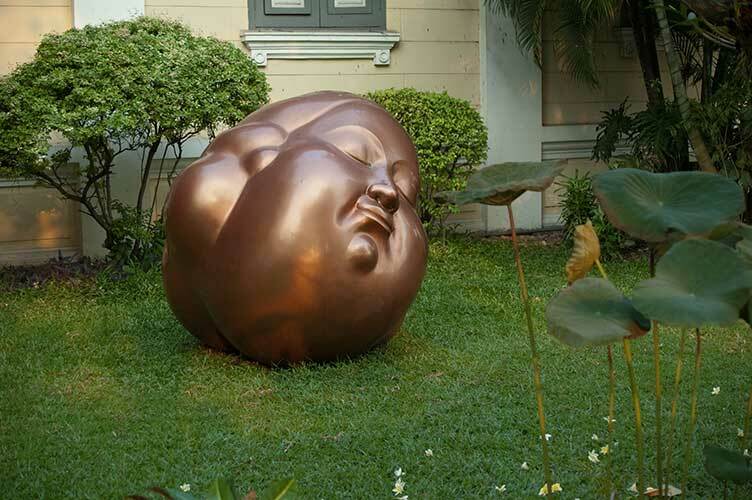 I walk to the other end of the street, cross the road and continue down another lane that twists and turns until I find myself on another main road and passing by the National Gallery with a sculpture of a Buddha head on the grass out front. Filled with newfound knowledge of our neighbourhood I return to our room hoping to lure Sue out for dinner. No luck. She’s hacking and wheezing, barely able to speak. So I venture forth again to refind a vegetarian menu I spotted earlier. I have a fine little meal and enjoy watching the variety of folks passing by. I return to the room to find Sue watching the Discovery Channel: Giant Killer Catfish! Nasty Microbes! Next morning I lead Sue off up the lane and beyond. She wants to walk and we continue until we spot a wat (pagoda). Where we attract the attention of several ‘off-duty policemen’ who insist that today is a Special Day (have we not read the papers, seen it on TV?). Sue is dubious and wants to get the heck away from there but I allow one to lead us to a state tourist office where I check out their story of cheap tuk-tuk fare to see the sights. All sponsored by the state as a ‘tourist promotion’. According to the agent it’s all legit. So we meet a young tuk-tuk driver who quotes us a super-low price and off we go. He’s a very nice lad and takes us first to the Giant Buddha. 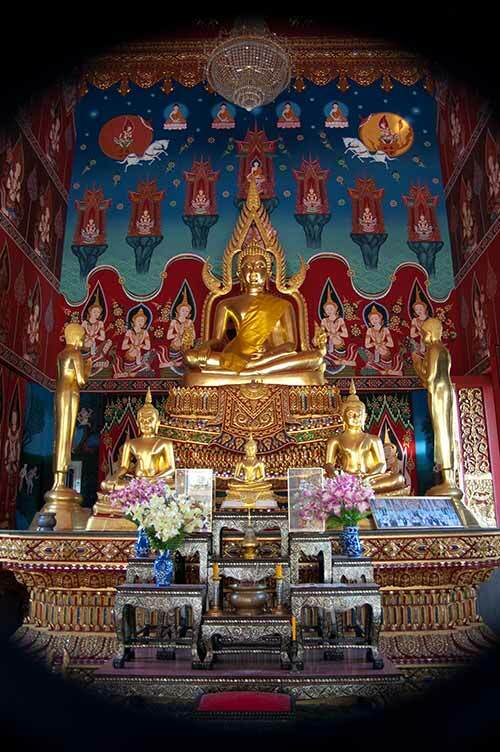 Amazing… all covered in gold leaf, continually applied by worshippers. Then on to the Lucky Buddha (only open today! A beautiful Buddha, this one of solid gold. But a man inside tells us how Today Only! Factory Outlet Tailored Goods Duty-Free! Sue’s eyes are rolling in a ‘I told you so’ fashion. Sure enough our driver takes us there, but tells us we can leave as soon as we want. He just needs to get his cheap fuel stamp. A salesman gives us a spiel but when Sue starts hacking and rasping he’s looking nervous. We’re out of there in no time at all and they didn’t even want our measurements for a tailored suit. We get our driver to drop us in Chinatown where street markets line the road (it’s Sunday market time). 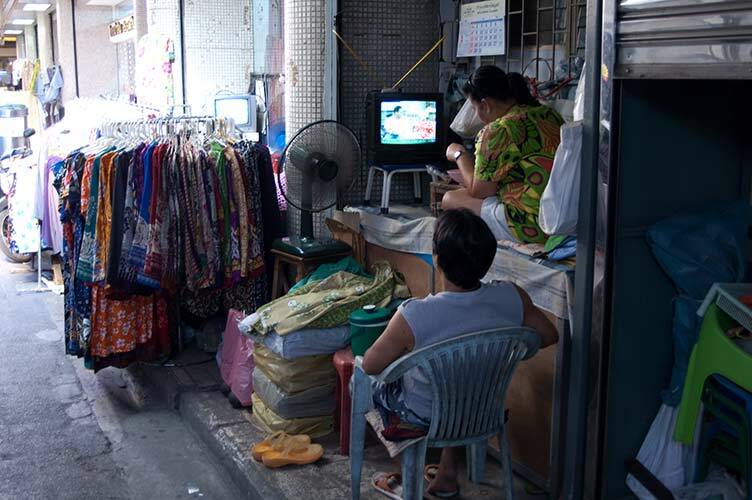 We walk into an alley and spend the next hour walking in a dense stream of shoppers checking out the bargains. We buy iced coffee and sliced papayas. But Sue’s having trouble swallowing and is beginning to tire. So we start walking back, and as she tires we begin looking for a ride. Tuk-tuk drivers want to charge us way too much. Taxis aren’t stopping… finally we negotiate with a tuk-tuk to return us to Khao San. While she snoozes I wander off again and this time find the river and the ferry docks. I walk along the river, through the university and then a large wat. 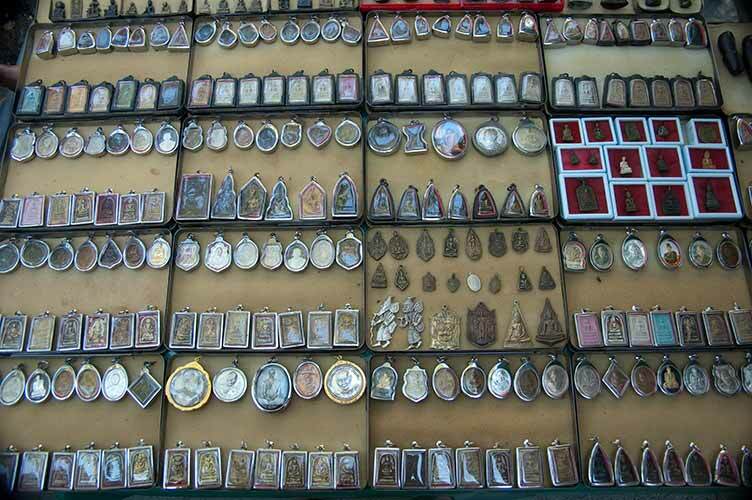 Along the road vendors are selling amulets and I notice some people have little magnifying glasses out to check the quality. I continue walking, exploring the perimeter of the backpacker area. 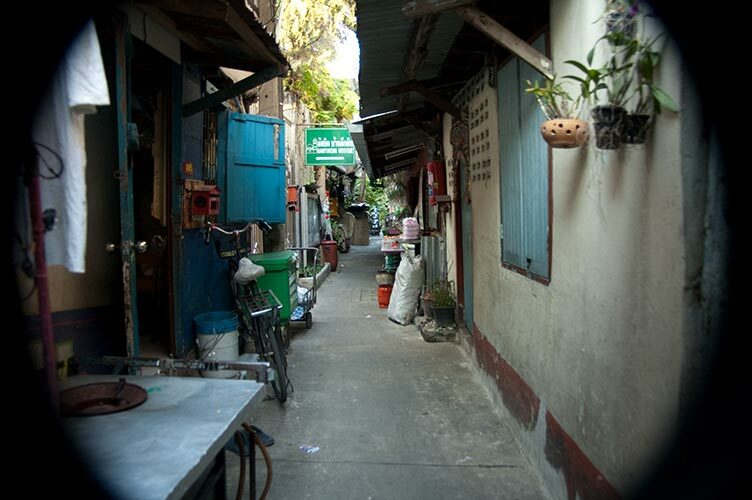 I walk back towards the backpacker area and then dodge into a narrow passage along a canal. 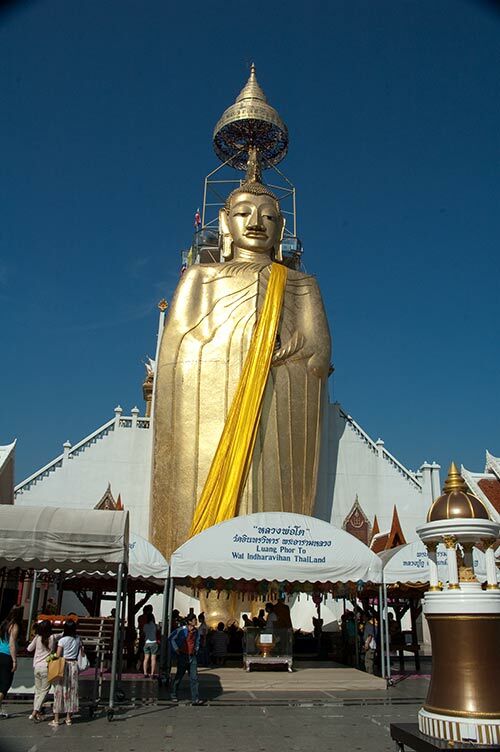 People point me in the right directions and I find myself in yet another wat (someone said there are 400 in Bangkok) with a huge golden stupa. 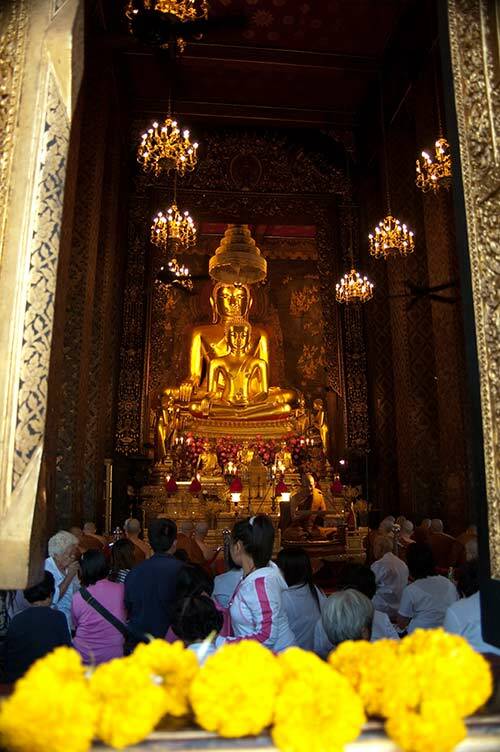 Eventually I wander to where the people are gathered to hear the monks and pray to another amazing, golden Buddha statue. Back in the backpacker zone I spot a bar with cheap big beers and settle down to watch the passing throngs. I sit back just far enough to avoid the street hawkers and catch a breeze from the overhead fans (a trick I learned in Hanoi). I don’t think I’ve ever seen so many dreadlocks in such a short time. 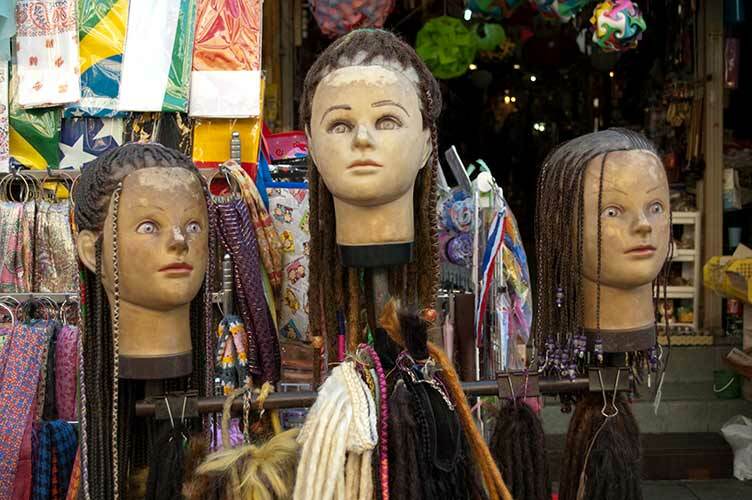 There are even dread extensions for sale. 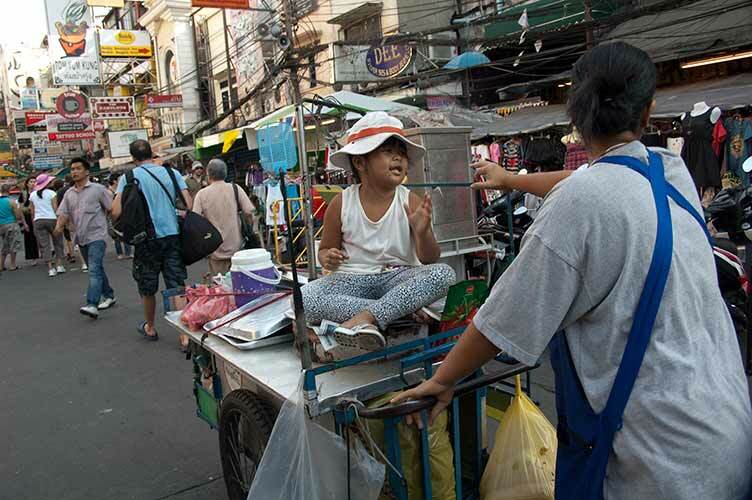 My favourite moment though is seeing the rubber chicken hawker (a long gray haired older Thai with a pirate’s hat) meet the hammock salesman, equally old and very wrinkled. Considerably relaxed after two big beers (and no lunch) I head back to the hotel. I persuade Sue to emerge for food and we have a lovely dinner in a tree covered courtyard down the alley from our hotel. Sue’s amazed at my capacity for Thai food, which I’m enjoying every hot moment of. After a bit more of the Discovery Channel’s microbes (no kidding) we end another hot day, our alarm set for an early start. 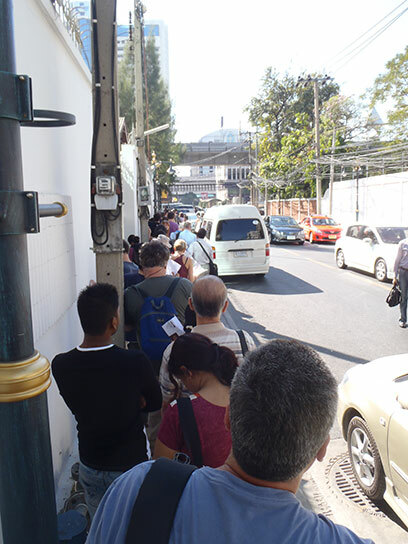 On Jan. 9 we visited the Myanmar Embassy to get our visas. We got up at dawn and headed down the passageway to have a real coffee (not Nescafe) to get us started. Then off to find a taxi. Harder than we expected. Most of the drivers wanted to negotiate a flat rate and we insist on using the meter. Finally we flag down an obliging driver. Off we go and right into a massive traffic jam. Our driver spoke little English but seemed friendly enough. He kept saying “MBK” which I thought was Thai for ’embassy’ perhaps (we’d shown him the address, written in English). 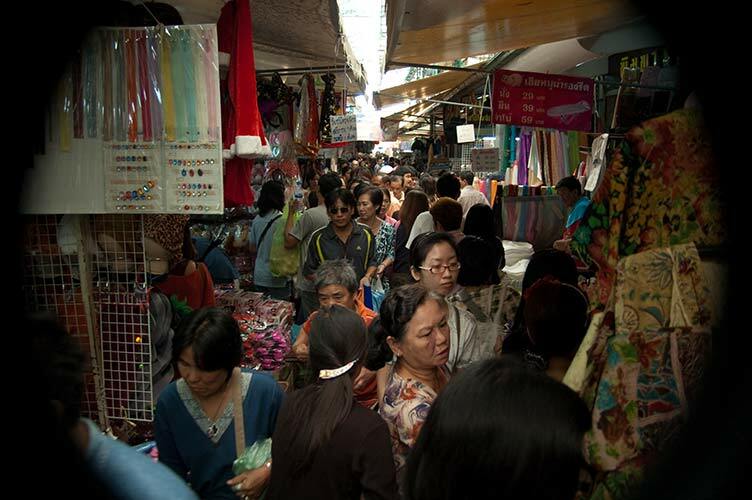 When he dropped us in the centre of Bangkok at the huge MBK mall we realized his/our mistake. We went to the Tourist Info, where she wrote the address out in Thai, along with a “Thank You!”. We flagged another taxi and set off again. This driver also spoke little English but we managed to communicate with his basic English, sign language and finally with the help of a basic English/Thai glossary on our map. We had a great time looking at his family photos, listening to his CD of English language music and he got us to our destination in almost no time at all. Only to see a Huge Line, leading to the embassy door. We got our paperwork done at a photocopy shop down the street and then joined the line. The line led to a window where we picked up a number. Then we waited for our number to be called while standing next to a lovely fan. While there we met a Canadian couple who’ve travelled in SEAsia for years. They provided many tips, including info about a secluded beach in southern Thailand. Finally, just before the embassy closing time we reached the wicket where we surrendered our passports and applications. Tomorrow we return for our visas. Our new Cdn. 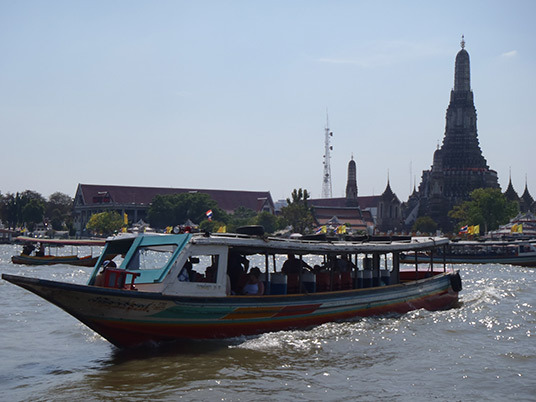 friends mentioned we could catch a boat back up the river to Khao San. What a difference! A one-stop train ride and then onto the ferry. Cheap, breezy and quick. Thank goodness for fellow travellers! We arranged for our hotel to send us to another location so that we could have a working aircon. That problem solved I went out for dinner and picked up some take-out for Sue. I sat and watched the scene again, but this time with sketchbook and pen handy. Tonight we’re in our new room (with working aircon), got our visas and enjoyed several trips on the river. Photos and text to follow soon. And then off to Myanmar. Previous postThe Start of a New SEAsia Adventure! Guess you’re well on your way thru Burma now. Can’t wait to read all about it! It’s been 12 years since I was in SEA and I always said I’d go back for more….maybe you’ll inspire me . Meanwhile, have a wonderful time, stay safe and healthy and we’ll look for the next installment.